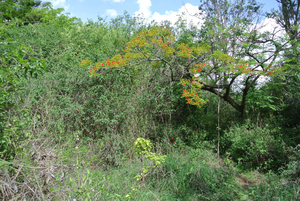 The garden is in a periurban area outside Arusha, surrounding a family house. Starting with a typical collection of exotic plantings, the garden has been gradually transformed into a more or less wild area with different zones of mainly indigenous vegetation, through selective cutting, and importing leaf litter and dung from surrounding areas. In the Fast Track Forest approach, developed gradually since 1983 in various habitats and locations, the gardener emulates the behaviour of a large browsing ungulate, in the Meru case an elephant. The resulting landscape can be imagined as an inverted egg box, with vegetation forming alternating mounds and glades. These create a maximum of soft boundaries and habitat niches, which are particularly varied botanically and rich in invertebrates and other wildlife. The density and variety of birds is particularly striking, with a consequently rich avian soundscape, divided into a number of micro habitats and concentrated in a number of 'hollowed out' areas, which function as small amphitheatres. Species you may hear: Tropical Boubou, Blue Spotted Wood Dove, Spotted Morning Thrush, Grey-Backed Camaroptera..
Good times to listen are just before dawn and dusk, both around 6. Tanzania time is set at UTC+3 throughout the year. The power supply and internet can be unreliable. Please be patient.